This story was different. And in a good original way. I liked it a lot, regardless of the fact that the main character is not likable at all. Cole is actually anything buy likable. He is arrogant, full of himself, does not care about anybody but himself, has a completely misguided sense of how people perceive him, and how he should treat others. The author has created an anti-hero character that you hate in the beginning and somehow start liking by the end of the book, because he gets under your skin. Or maybe it is not about liking Cole but more about empathising with him, or understanding his misconceptions. This is a prequel to the series, in which, it seems, the Cole is the main character. This is like the origin story, the story that sets the tone and puts him in a certain place so the real story can start. It was meant to create the interest in the character, and it did, because I continued with the first book immediately. Again, I cannot emphasise enough how good this author is in portraying impossible situations and unconventional characters and bringing them closer to the reader. The author’s unique writing style, sprinkled with his signature satirical tone, draws you in and keep you engaged. As most of his stories, this one is situated somewhere in the Omniverse. 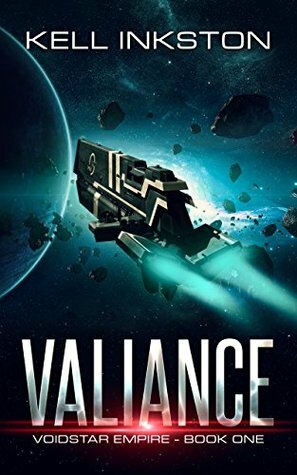 Valiance starts immediately where Defiance left off, and it is an amazing book. Cole is still the main character, or one of the main characters. The story starts after Cole accepts the job in the military ranks on the planet Arda in the Lascardian Empire, where humans are feared. Lascardian empire is populated by highly intelligent insectoid creatures of approximately human size and very interesting culture. Apart from Cole, there is mysterious The Human, three Ardians, Azi Hoss and Eqarne, and a very funny android Coffee. Their interactions are very entertaining and some of the dialogues and speeches did make me laugh, but the story is very serious and not a laughing matter, as the little crew of misfits is trying to save the Empire against all odds. Seriously, I love this author and this story is written in his style that I love so much. As most of his works, this story is situated somewhere within his Omniverse. It is action packed from beginning to the end, quite unpredictable at times, full of cool technical terms, and the characters are incredibly well developed and interesting. And yes, regardless of my initial reservations, I do very much like Cole now. And the insect people are great as well. I love how the author expands the Omniverse with every story he writes, and every time I feel like I am transported right into the centre of action. There are some secrets in this book that I do not wish to reveal, but if you like Nocturna League, you will love this series as well. I am immediately starting with the next book. A.C.E. is short for Automated Combatant Emulator, a type of an AI robots created by O.E.L. H.E.G. is short for Her Eternal Goddess, in relation to the O.E.L.’s psuedo-patron saint/deity, Rondi. Additionally, the author has graciously agreed to let me share his explanation and background on the planetary system and some more abbreviations. There are two additional short stories from the same Omniverse but they are not directly connected to the Voidstar Empire stories. This is a first person account story about a mission gone terribly wrong, on a planet that should have been left alone. It is written in the author’s signature satirical style and it was somewhat scary, but very much fun and entertaining read. There are casualties in this story and some strange creatures. This is an interesting and philosophical short story about humanity v. A.I. It describes one event of the encounter of two space ships and their crews, somewhere in the Omniverse. Very enjoyable read. More about Kell Inkston and his books can be found on Goodreads and the author’s website. The image belongs to Kell Inkston and is used with his permission.